A developmental reading text aimed at students who have some basic reading skills but need more help improving and refining those skills. 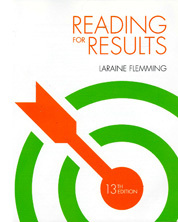 Even more than the 12th, the 13th edition of Reading for Results shows students, step by step, how to recognize and respond to the verbal clues writers leave behind in order to help readers reconstruct their intended meaning. For instance, the chapter on general and specific sentences has been completely revised to better show students how to use the author's words to determine the specific topic and then use that topic to discover the general main idea. Although finding the topic sentence/main idea statement remains in the book as a way of confirming that a reader is in tune with the author, it's no longer treated as the sole object of the reader's search. Research suggests that focusing exclusively on the search for the topic sentence distorts the nature of the reading process since skilled readers start constructing a meaning as soon as their eyes hit the page or the screen. They don't wait until they see the topic sentence to decide what the author's overall message might be. This edition purposely gives pride of place to determining a main idea that can be expressed in several different ways, depending on the reader and the clues in the text. The topic sentence, then, serves as confirmation that the reader is on the right track. New to the 13th edition is a discussion of how students using digital devices need to adapt their onscreen reading habits to digital texts, where skimming is very much not the order of the day, although research shows that students tend to speed up, rather than slow down, when they read on a screen. Back by popular demand are explanations of what visual aids can add to an author's message. In chapter after chapter, students get to see which visual aids match up best with specific patterns of organization and content. In general, students are also encouraged to create their own visual images of the content they both read and write about, and the 13th edition introduces more visual forms of note taking as well as the role of argument diagrams in creating a persuasive essay.